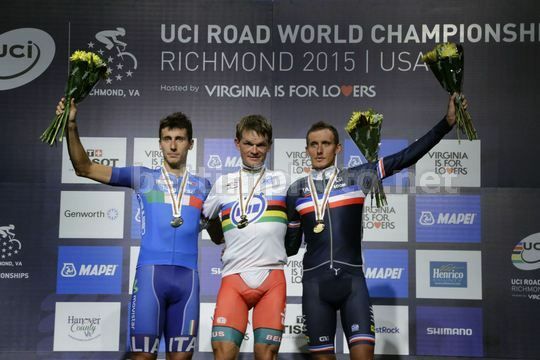 Presentazione della cronometro individuale uomini professionisti dei Mondiali di Richmond 2015: descrizione del percorso con altimetrie e planimetrie, i dettagli degli ultimi chilometri; le squadre ed i corridori partecipanti; risultati con ordine d'arrivo e classifiche; video televisivo/youtube e fotografie; commenti, pronostici e scommesse. The Elite Men will begin their “race of truth” 20 miles north of Richmond at Kings Dominion, Virginia’s premier amusement park in Hanover County. Racers will then speed past Meadow Event Park, home to the State Fair of Virginia and birthplace of thoroughbred racing legend Secretariat. Racers will head south on long, open straights past the Hanover County Courthouse, the third oldest courthouse still in use in the U.S. and dating back to about 1740. Long hills on Brook and Wilkinson roads bring the racers back into the city through Virginia Union University before turning into downtown. Nearly half the turns of the entire route fall within the closing kilometers, the second to last of which is onto the 300-meter-long climb up Governor Street. At the top, riders turn left and finally face a false flat 680 meters to the finish.